CASTLE will make some festivals stops throughout their upcoming journeys including performances at the Fire In The Mountains in Jackson Hole, Wyoming, Tour Of The Doomed in Milwaukee, Wisconsin, Shadow Woods Metal Fest in White Hall, Maryland, and the Stoned Meadow Of Doom Fest in Omaha, Nebraska. 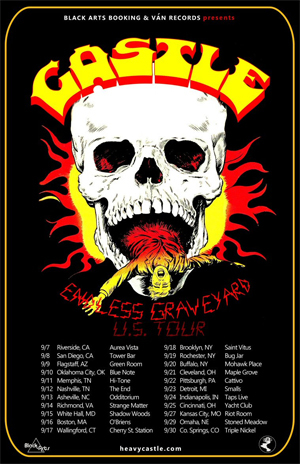 Since the release of their most recent offering, Welcome To The Graveyard, issued last summer via Ván Records, CASTLE's massive 170-date world takeover has included tours of the US, Europe, Canada, and the band's first ever tour of Japan last December. See all confirmed dates below. In anticipation of the upcoming shows, CASTLE is pleased to unveil the visual accompaniment to the track "Black Widow", compiled from footage from their Canadian tour last year and viewable on KNAC.COM HERE. CASTLE's Welcome To The Graveyard offering was captured by Billy Anderson at Type Foundry Studios in Portland, Oregon and is currently available HERE.